I don't know art, but I know what gets me high. 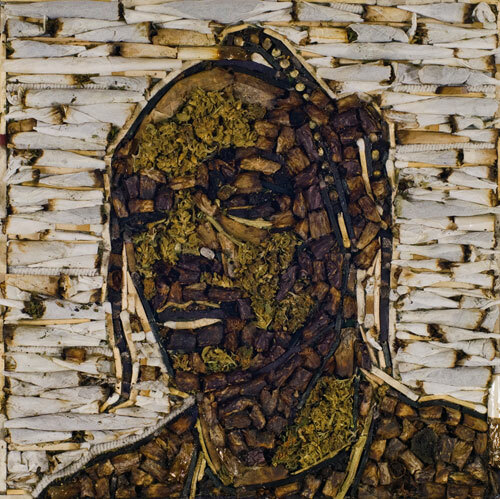 Dogg, Snoop — Conceptual visual artist Jason Mecier, who has in the past used a number of different mediums — candy, beans, yarns, pencils — to construct greater images, has revealed his latest work: a portrait of hip-hop/rap pioneer Snoop Dogg, made from hash, joints and actual marijuana. Art lovers wishing to purchase the work can do in the parking lot behind the Winn Dixie (not the one where the security cameras are). Nintendo — Dubbed a “Miracle Nintendo” by the press, a Maryland woman claims that the image of Jesus Christ appeared on an NES console she purchased over eBay. If you think that’s impressive, you should see when he grows a raccoon tail, flies, and destroys Bowser. Nirvana — Former Nirvana members Dave Grohl and Krist Novoselic (because really, what else does Krist Novoselic have to do these days?) appeared in a Sirius-XM radio interview moderated by Jon Stewart to celebrate the twentieth anniversary of the smash game-changing album Nevermind. Among some of the great revelations from the panel? All that flannel was really hot and their hair is infinitely cleaner these days. Oz, Wizard of — An intact pair of ruby slippers — worn by Judy Garland’s Dorothy — from the 1939 classic film The Wizard of Oz is expected to garner two to three million dollars when a California auction house sells them in December. The slippers should make a nice addition to the house of a very rich, gay man. Queen — For those of you out there, like me, who are massive Queen fans, UK’s Telegraph recently ran a solid interview piece on former guitarist Brian May’s forty years with the Brit classic rock crew, touching on his depression and the dark period brought upon by frontman Freddie Mercury’s death. Solid reading here, folks. Not a Kardashian in sight. Rooney, Andy –– The seminal 60 Minutes commenter announced Tuesday that his segment on the upcoming Sunday’s show will be his last, as he is stepping down from the podium after thirty-plus years. Those of you looking for “street signs that just don’t make sense,” “things which aren’t the way they used to be” or “ridiculous ways young people are dressing these days” are encouraged to visit your elderly grandparents more to get your fix.